15th April 2013- The Ascamm Foundation, the Technology Centre which is an international benchmark in industrial technologies and a member of TECNIO – the network created by ACC1Ó which promotes differential technology, business innovation and excellence- has signed a cooperation agreement with the Barcelona Macula Foundation with the aim of jointly developing technological solutions which make progress in combating blindness. The Barcelona Macula Foundation is a non-profit body whose principal aims are to promote and assist research into blindness-causing diseases related to the macula, the retina and the eyes in general. 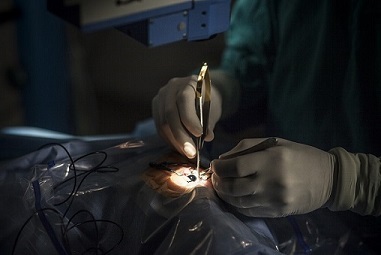 The agreement lays the basis for the two foundations to cooperate and continue progressing in the development of technical and instrumental systems which address different cellular regeneration therapies for the recovery of vision, based on the experience of the Ascamm Technology Centre in the field of micromanufacturing. In the words of Dr. Jordi Monés, the Director of the Barcelona Macula Foundation, “the knowledge of the pathologies and our experience in many research projects enable us to work on the development of clinical treatments and technologies which prevent sight loss and which enable it to be recovered when this occurs”. The increase in life expectancy in the developed world has brought a growth in the prevalence of diseases which until recently had scarce impact and which have a major effect on the quality of life of sufferers. This is the case of degenerative diseases of the retina and the macula, which involve vision loss which can cause blindness and for which there are still no effective treatments. Blindness currently affects 0.15% of the Spanish population (more than 70,000 people), at an annual direct and indirect cost of 358 million euros. According to the figures provided by the Spanish National Organisation for the Blind (ONCE), over 700,000 people in Spain suffer from age-related macular degeneration and around 2 million from diabetic retinopathy. It is calculated that there are currently 284 million people worldwide with some kind of visual problem. Of these, 39 million are blind, the equivalent of 0.7% of the world’s population. Experts estimate that eight out of every ten cases of blindness in the world and also in Spain could be avoided with preventative measures and early diagnosis. 80% of cases of blindness could have been avoided with periodic visits to the ophthalmologist. As both foundations have stated, technological progress is essential, not only to reduce blindness or visual impairment, but also to lower the financial cost this represents. Ascamm possesses extensive experience in the development of innovative solutions in healthcare products, implants, instruments and equipment for the sectors of medical technologies, orthopaedics and dentistry. Moreover, Ascamm specialises in micromanufacturing, advanced processes with technical polymers and compounds, replacement of metals by polymers, product personalisation and assistance with industrialisation and certification and also offers the possibility of accompanying projects with technical and economic viability studies, life cycle analysis and ecodesign. A scientific foundation created to combat blindness through basic and preclinical research and by collaborating in clinical research projects. Its scientific team has worked on research projects which have helped to improve current treatments for macula and retina-related diseases. It is currently focussed on the fight against macular and retinal degenerative diseases which cause blindness and have no treatment, such as dry AMD, pigmentary retinosis or Stargardt’s disease, with innovative projects which include regenerative and cell therapy. It has cooperation agreements with bodies such as the Catalan Institute of Nanotechnology, the Institute of Photonic Sciences, the Catalan Institute of Bioengineering, the Vall d’Hebron University Hospital and the Autonomous University of Barcelona.